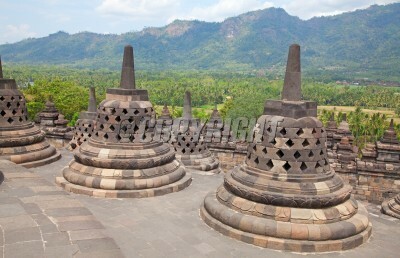 Borobudur is the biggest Buddhist temple in the ninth century measuring 123 x 123 meters. Began in the eighth century, under the Sailendra dynasty. Framed by four volcanoes, it stands 105 feet (32 meters) high. 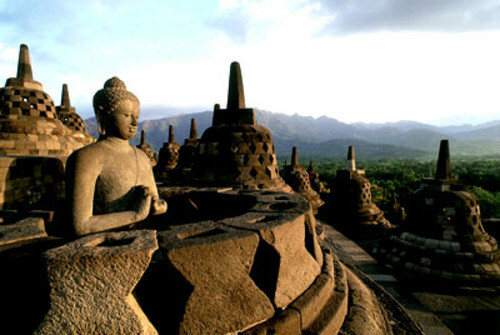 Considered as the highest symbol of Buddhism, Borobodur stupa is a replica of the universe. Borobudur Temple symbolises the micro-cosmos and divided into three levels. The first level marks the man's world of desire that is influenced by negative impulses; the middle level marks the world where man has control of his negative impulses and uses his positive impulses; the highest level marks the world of man that is no longer bounded by physical and worldly ancient desire. 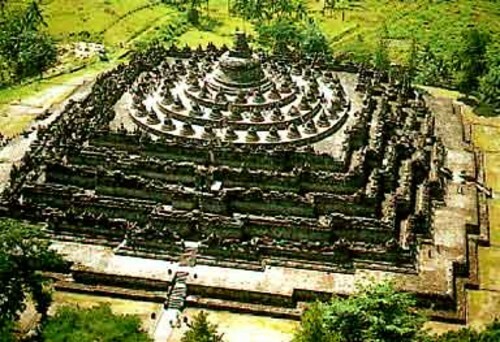 Therefore, we can say that Borobodur Temple represents the ten levels of a Bodhisattva's life. The site is open to public entrance from 6AM-5PM. US$15/Rp 135,000 for adult non-Indonesians. US$8/Rp 72,000 for non-Indonesian registered students (proof, e.g. ISIC, is required). Rp 15,000 on weekdays and Rp 17,500 at weekends for Indonesian adults or foreign holders of an Indonesian work permit.